Tomorrow Serena (left) and Venus (right) Williams will meet for the fourth time in the Wimbledon women's final. 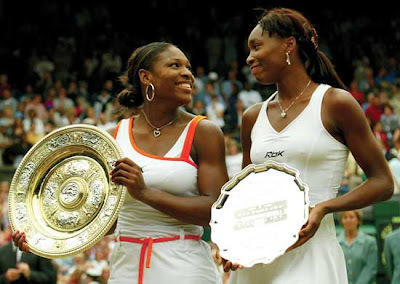 They last played in the final at the All England Club in 2003, a three-set match in which Venus was forced to play through hip and abdominal injuries and eventually lost. I am a Tennis open junkie.. and it is rare these days that I get to root for someone born in the USA.. so forgive my post title.. go Williams sisters! I've not always been a fan of the Williams sisters, but I've been more impressed with them this year for some reason. Since it's been longer for Venus, I'll be cheering for her. Either way, go USA! I used to be a major tennis fan. But, I began losing interest as the US stopped producing as many quality players. I've loved watching the Williams sisters grow up and mature. But, their matches against each other have historically been boring with more errors hits than winners. Also, it's hard for me to pick one to root for. So, I find myself hoping they don't face each others in the finals. Saturday they put on a great show though. Amazing how three hours after their singles final Venus and Serena won the Wimbledon doubles title.. they are great athletes!